Boiling is the rapid vaporization of a liquid, which occurs when a liquid is heated to its boiling point, the temperature at which the vapour pressure of the liquid is equal to the pressure exerted on the liquid by the surrounding atmosphere. There are two main types of boiling: nucleate boiling where small bubbles of vapour form at discrete points, and critical heat flux boiling where the boiling surface is heated above a certain critical temperature and a film of vapor forms on the surface. Transition boiling is an intermediate, unstable form of boiling with elements of both types. The boiling point of water is 100 °C or 212 °F but is lower with the decreased atmospheric pressure found at higher altitudes. Boiling water is used as a method of making it potable by killing microbes that may be present. The sensitivity of different micro-organisms to heat varies, but if water is held at 70 °C (158 °F) for ten minutes, many organisms are killed, but some are more resistant to heat and require one minute at the boiling point of water. Boiling is also used in cooking. Foods suitable for boiling include vegetables, starchy foods such as rice, noodles and potatoes, eggs, meats, sauces, stocks, and soups. As a cooking method, it is simple and suitable for large-scale cookery. Tough meats or poultry can be given a long, slow cooking and a nutritious stock is produced. Disadvantages include loss of water-soluble vitamins and minerals. Commercially prepared foodstuffs are sometimes packed in polythene sachets and sold as "boil-in-the-bag" products. Nucleate boiling is characterized by the growth of bubbles or pops on a heated surface, which rises from discrete points on a surface, whose temperature is only slightly above the liquids. In general, the number of nucleation sites are increased by an increasing surface temperature. An irregular surface of the boiling vessel (i.e., increased surface roughness) or additives to the fluid (i.e., surfactants and/or nanoparticles) can create additional nucleation sites, while an exceptionally smooth surface, such as plastic, lends itself to superheating. Under these conditions, a heated liquid may show boiling delay and the temperature may go somewhat above the boiling point without boiling. As a method of disinfecting water, bringing it to its boiling point at 100 °C (212 °F), is the oldest and most effective way since it does not affect the taste, it is effective despite contaminants or particles present in it, and is a single step process which eliminates most microbes responsible for causing intestine related diseases. Water's boiling point rests at around 100.0 degrees Celsius, when at an elevation of 0. In places having a proper water purification system, it is recommended only as an emergency treatment method or for obtaining potable water in the wilderness or in rural areas, as it cannot remove chemical toxins or impurities. The elimination of micro-organisms by boiling follows first-order kinetics—at high temperatures, it is achieved in less time and at lower temperatures, in more time. The heat sensitivity of micro-organisms varies, at 70 °C (158 °F), Giardia species (causes Giardiasis) can take ten minutes for complete inactivation, most intestine affecting microbes and E. coli (gastroenteritis) take less than a minute; at boiling point, Vibrio cholerae (cholera) takes ten seconds and hepatitis A virus (causes the symptom of jaundice), one minute. Boiling does not ensure the elimination of all micro-organisms; the bacterial spores Clostridium can survive at 100 °C (212 °F) but are not water-borne or intestine affecting. Thus for human health, complete sterilization of water is not required. 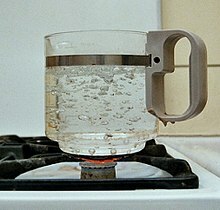 The traditional advice of boiling water for ten minutes is mainly for additional safety, since microbes start getting eliminated at temperatures greater than 60 °C (140 °F) and bringing it to its boiling point is also a useful indication that can be seen without the help of a thermometer, and by this time, the water is disinfected. Though the boiling point decreases with increasing altitude, it is not enough to affect the disinfecting process. 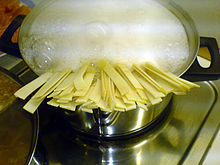 Boiling is the method of cooking food in boiling water or other water-based liquids such as stock or milk. Simmering is gentle boiling, while in poaching the cooking liquid moves but scarcely bubbles. The boiling point of water is typically considered to be 100 °C or 212 °F. Pressure and a change in the composition of the liquid may alter the boiling point of the liquid. For this reason, high elevation cooking generally takes longer since boiling point is a function of atmospheric pressure. In Denver, Colorado, USA, which is at an elevation of about one mile, water boils at approximately 95 °C or 203 °F. Depending on the type of food and the elevation, the boiling water may not be hot enough to cook the food properly. Similarly, increasing the pressure as in a pressure cooker raises the temperature of the contents above the open air boiling point. Some science suggests adding a water-soluble substance, such as salt or sugar also increases the boiling point. This is called boiling-point elevation. At palatable concentrations of salt, the effect is very small, and the boiling point elevation is difficult to notice and this is why experiments to prove this are considered inconclusive. However, while making thick sugar syrup, such as for Gulab Jamun, one will notice boiling point elevation. Due to variations in composition and pressure, the boiling point of water is almost never exactly 100 °C, but rather close enough for cooking. Foods suitable for boiling include vegetables, starchy foods such as rice, noodles and potatoes, eggs, meats, sauces, stocks, and soups. Boiling has several advantages. It is safe and simple, and it is appropriate for large-scale cookery. Older, tougher, cheaper cuts of meat and poultry can be made digestible. Nutritious, well-flavored stock is produced. Also, maximum color and nutritive value is retained when cooking green vegetables, provided boiling time is kept to the minimum. Boiling can be done in several ways: The food can be placed into already rapidly boiling water and left to cook, the heat can be turned down and the food can be simmered or the food can also be placed into the pot, and cold water may be added to the pot. This may then be boiled until the food is satisfactory. Water on the outside of a pot, i.e., a wet pot, increases the time it takes the pot of water to boil. The pot will heat at a normal rate once all excess water on the outside of the pot evaporates. Boiling is also often used to remove salt from certain foodstuffs, such as bacon if a less saline product is required. At any given temperature, all the molecules in a liquid do not have the same kinetic energy. Some high energy particles on the liquid surface may have enough energy to escape the intermolecular forces of attraction of the liquid and become a gas. This is called evaporation. Evaporation only happens on the surface while boiling happens throughout the liquid. When a liquid reaches its boiling point bubbles of gas form in it which rise into the surface and burst into the air. This process is called boiling. If the boiling liquid is heated more strongly the temperature does not rise but the liquid boils more quickly. This distinction is exclusive to the liquid-to-gas transition; any transition directly from solid to gas is always referred to as sublimation regardless of whether it is at its boiling point or not. Wikimedia Commons has media related to Boiling. Look up boiling in Wiktionary, the free dictionary. ^ Doretti, L.; Longo, G. A.; Mancin, S.; Righetti, G.; Weibel, J. A. (2017). "Nanoparticle Deposition During Cu-Water Nanofluid Pool Boiling". Journal of Physics: Conference Series. 923 (1): 012004. doi:10.1088/1742-6596/923/1/012004. ISSN 1742-6596. ^ "Melting Point, Freezing Point, Boiling Point". chemed.chem.purdue.edu. Retrieved 2019-01-11. ^ US EPA, OW (2015-11-18). "Emergency Disinfection of Drinking Water". US EPA. Retrieved 2019-01-11. ^ Curtis, Rick (March 1998). "OA Guide to Water Purification, The Backpacker's Field Manual". ^ Rickus, Alexis; Saunder, Bev; Mackey, Yvonne (2016-08-22). AQA GCSE Food Preparation and Nutrition. Hodder Education. ISBN 9781471863653. ^ Publishing, D. K. (2005-08-29). The Cook's Book: Techniques and tips from the world's master chefs. Penguin. ISBN 9780756665609. ^ IAPWS. "What is the effect of pressure on the boiling of water? Why does water boil at a lower temperature at high altitudes?". FAQs About Water and Steam. Archived from the original on 2009-08-06. Retrieved 2009-12-05. ^ Rennie, Richard (2016). boiling-point elevation. A Dictionary of Chemistry. Oxford: Oxford University Press. ISBN 9780198722823.